This Wiki is a knowledge base covering the topic of the discrimination of boys and men. Evidence for this kind of discrimination is scattered throughout the internet. Hence, the sheer amount of information can be overwhelming at times and different accounts of the same problem can be very confusing. This is why information about the discrimination of boys and men is collected, structured and inter-linked on this wiki. WikiMANNia is the antithesis of the feminist victim culture and hate ideology. 939 articles have been created since April 2011. The aim of WikiMANNia is to deliver facts to MRAs, bloggers and journalists. To ensure a good quality of the articles, access to writing is restricted to our editors. All entries must be based on reliable sources. 1st August 2011 - WikiMANNia in English started! 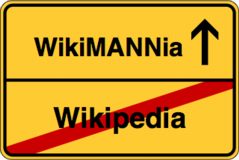 January 2009 - German WikiMANNia started! Use our contact form and support us with information. We are open to requests, suggestions and ideas. Are you fluent in written English and do you want to participate in this wiki? Register here and become an editor. Our wiki is dedicated to helping users find independent, uncensored ideas and facts about men's rights. We hope we can help you. This page was last modified on 5 April 2017, at 21:27. This page has been accessed 184,043 times and contains 1,773 characters or 229 words.